The TrustTheVote Project is proud to announce the launch of the Pennsylvania Voter Registration App developed in partnership with Rock the Vote, Pennsylvania Voice, and the office of the Pennsylvania Secretary of State. This first in the nation program is the culmination of over a year of work and marks a significant improvement in the voting experience for the citizens of Pennsylvania. 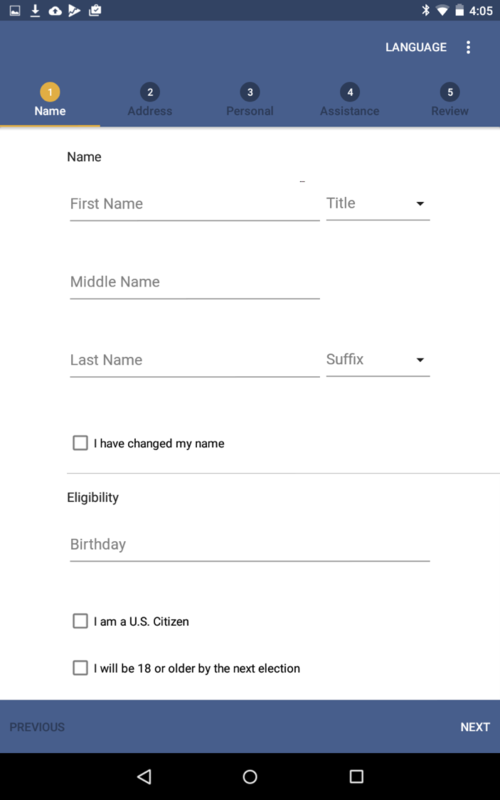 The mobile App, which is available for Android users, leverages Pennsylvania’s innovative approach to online voter registration (OVR) to lower costs and increase efficiency. Starting with a Pilot this election season, canvassers using the App are able to digitally submit voter registration applications directly to the Secretary of State’s office for approval. Additionally, canvassers can accept electronic signatures captured via a stylus, and partner organization can access non-sensitive registrant data. This will eliminate the need for registrants to take further action and will ease the process of registering voters without driver’s licenses. So, how does it work and why does it matter? Over the past decade we have observed that election systems are too often viewed as a backwater of government IT. Paradoxically, we also ask these same departments to be experts in the latest technology. We believe this presents an opportunity to re-imagine the role of election officials in the registration process. The technology certainly needs to be updated, but perhaps the underlying model needs to be examined as well. Rather than building a single State-owned web page for conducting (OVR), the Pennsylvania Secretary of State invested in a system that allows 3rd parties to build software that connects directly to their office. This system is unique in that it works without constant internet access, providing constant access to electronic voter registration without the need for WiFi or a data plan. In short, this approach bridges the space between one of the the core competencies of election officials – building and maintaining voter lists – and the strengths of 3rd party organization – directly engaging and registering the communities they serve. This is a significant development for the people of Pennsylvania and for our Democracy. We are impressed by the State’s willingness to take bold action on this topic and develop a tool that is responsive to the needs of the people. The finals solution is unique, forward thinking, and a model for the rest of the country. The TrustTheVote Project is a longtime technology partner of Rock the Vote and we are excited to see another project come to fruition. Applications are completed on the App and passed directly to the Pennsylvania Department of State for approval, saving both county and state elections officials time and money. 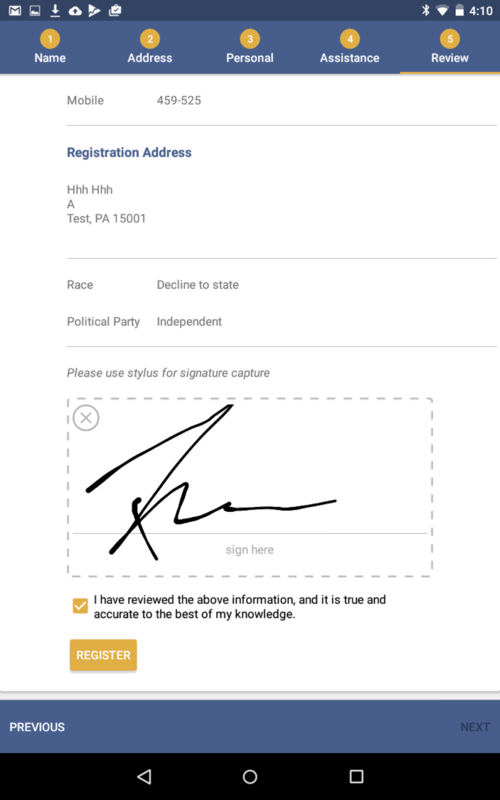 Electronic signatures are accepted via a stylus, allowing all eligible voters – even those without a PennDOT ID – to get registered. All applications submitted to the Department of State’s office are complete, significantly lowering the possibility of rejected applications. Automatically captures nonsensitive registrant information that is immediately made available to partners through Rock the Vote’s partner portal. It does not require constant data or internet connectivity to electronically register voters. Available to voters in English and Spanish. Initial release available for Android, but will eventually expand to cover iOS.